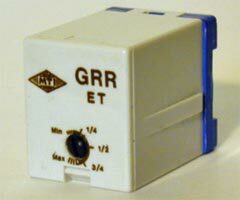 Timer relay adjustable from 0.2 to 150 s in 4 ranges - all static- static output 0,3 A I max - 5 mA I min. Pluggable on socket. Pins at the standard pitch of 2.54 mm.